More time travel, courtesy of The Old Print Shop, 150 Lex [29th/30th] 212.683.3950. William Niblo opened the 3000-seat Niblo's Garden at Broadway and Prince in 1829, attracting famous thespians of the time (people like Charles Kean and Edwin Forrest). It was also home to The Black Crook, a five-and-a-half-hour extravaganza generally said to be the first musical. 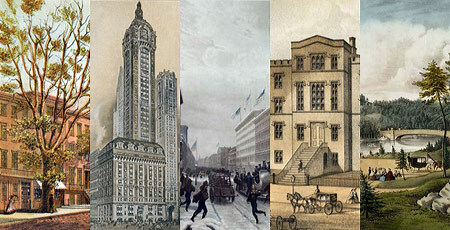 In 1852, the luxurious Metropolitan Hotel opened on the site, subsuming Niblo's Garden. It was the first hotel in the country to allow guests to eat when they chose, rather than at seatings. The Metropolitan was often referred to as Niblo's Hotel, as on this print. More on Niblo's. to New York. The tree "stood for years near the old Varian homestead"
New York's Historic Trees [PDF] in 1902. Hoffman House and Restaurant was a hugely popular spot at Broadway and 24th, not least because of its racy artwork Nymphs and Satyrs by William-Adolphe Bougereau. For the musical Sweet Adeline, Jerome Kern wrote "Hoffman House" in which a quartet of men in the Hoffman bar sing of their romantic yearnings. It is one of the great, little-known pieces in musical theater, both brooding and soaring. You think Soho is too crowded now? Check out this Winter Scene on Broadway between Prince and Spring. If we could bring back one New York City building, it would of course be the old Penn Station. But if we could bring back two, the second would be the Singer Building, designed by Ernest Flagg for the Singer Sewing Company, completed in 1908. At 41 stories, it held the title of world's tallest building for over a year. U.S. Steel bought the building in 1964 and demolished it three years later. It is now One Liberty Plaza. This view of the Ruins of the Great Fire of New York, from the corner of Broad and Beaver. But what's shown here isn't the Great Fire of NY that took place in December, 1835 and which is recounted here. The 1835 fire, which was the bigger one, spread as a result of fierce winter winds. A decade later, in nearly the same spot, a fire broke out that spread to a warehouse filled with saltpeter (used in making gunpowder). That explosion and the resulting fire left over 300 buildings destroyed. More on the 1845 fire here. fri 8pm: rooftop films kicks off its 15th (!) season of screenings with a series of short films from around the world. open road rooftop (350 grand street), $10. sat 12-5pm: reenactments, ship replica, rides, crafts, food, more at the scandinavian east coast museum's viking fest. bliss/owls' head park (bay ridge). sat-sun 12-5pm: the 38th (!) annual ninth avenue international food festival has foods from around the world, 200+ vendors, live entertainment, more. 9th ave bet. 42nd + 57th st.
sat-sun: the new york photo festival takes over dumbo with exhibitions, lectures, more. $15/day.